Oil painting colors vary in their degree of transparency. You will soon discover how much more the transparent colors on your palette are affected than the opaque colors, when mixed with white. This does not necessarily mean that all transparent colors possess less tinting strength. 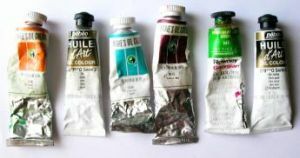 On the contrary, such transparent and semi-transparent colors as Prussian Blue, Thalo Green, Thalo Blue, and Alizarin Crimson have a powerful tinting capacity. It is useful to know of this varying degree of transparency in the colors on your palette, both for mixing and for glazing and scumbling. The table below gives you a snapshot of the qualities and characteristics of the most common oil painting colors.